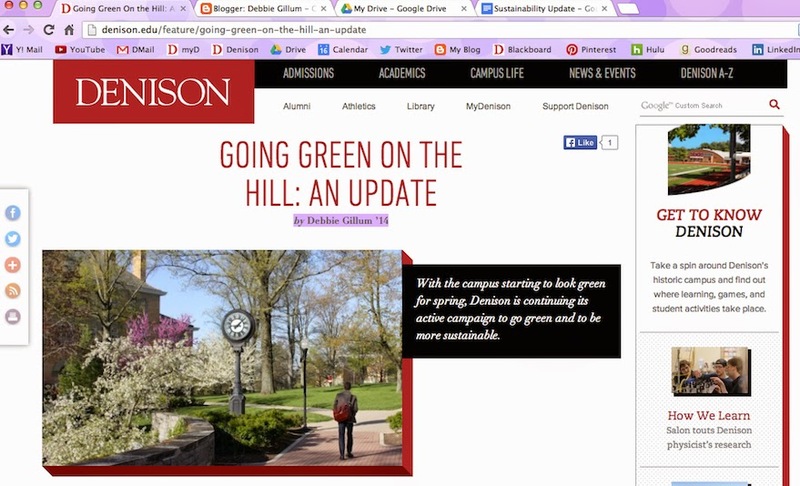 With the campus starting to look green for spring, Denison is continuing to go green and be more sustainable. Facilities Services has been improving buildings by replacing old light bulbs with fluorescent lights that consume less energy and have a longer lifespan. They have also added occupancy sensors that automatically turn off not the lights and reduce the heating and air conditioning in unoccupied rooms. Most recently, the facilities team has started working on updating the heating and air conditioning systems in Knapp and Olin. “We started the work over spring break. 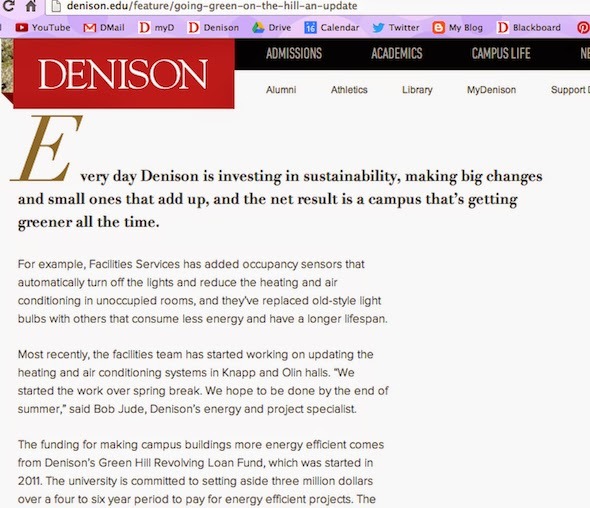 We hope to be done by the end of summer,” said Bob Jude, Denison’s Energy and Project Specialist. The funding for making campus buildings more energy efficient comes from the Green Hill Revolving Loan Fund, which was started in 2011. The university is committed to setting aside three million dollars over a four to six year period to be used to fund energy efficient projects. The fund is revolving in the sense that it uses the proceeds from energy savings to fund future projects. This fund is part of the Billion Dollar Green Challenge initiative, which challenges over 30 universities to make a commitment to green revolving funds. For example, when money is invested in replacing older lighting in residential halls with newer, more efficient florescent lights, then the savings from what would have spent on electricity goes back into the fund. In about three to six years, the improvements will result in a return on investment. “Since the start of the fund, we have invested about $1.2 million, mostly on lighting. Through these sustainable investments, we have saved roughly $300,000,” said Jeremy King, the Campus Sustainability Coordinator. Each year, the facilities team has about $450,000 to invest in making campus improvements. A set amount of $50,000 is set aside to be used for community initiatives, such as ideas for solar panels or outdoor LED lights. Ideas can be submitted by anyone to Jeremy King. With improved heating and cooling systems as well as lights, energy consumption has decreased by ten percent. “But, this doesn’t mean that our costs are down,” Jude said. He explained how with rising energy costs, the reduction in energy consumption results in spending roughly the same each year. The reductions help to combat inflation. 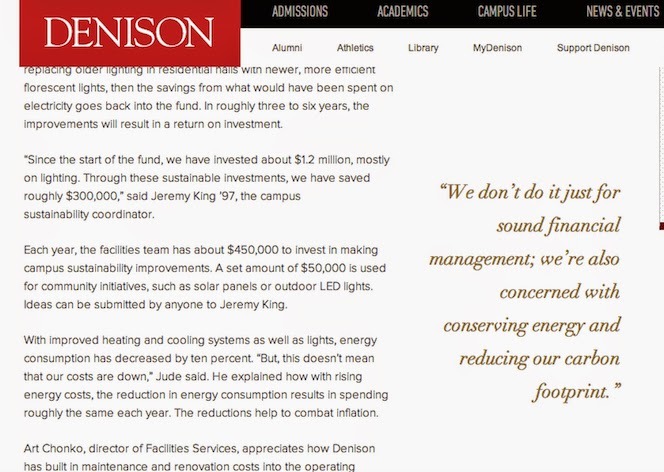 Art Chonko, director of Facilities Services, appreciated how Denison has built in maintenance and renovation costs into the operating budget. He said that does not happen at all universities. After Olin and Knapp, Chonko hopes the Facilities team will work on making the library and Mitchell use energy more efficiently. He said that the idea of using more solar panels was also being explored. While the Facilities team works to reduce energy consumption through upgrading technology, a fair amount of energy can be saved by making simple behavioral changes. “When devices are left plugged in, they still use energy. They don’t use a lot of energy but there are a lot of these devices around campus,” said Jude. Chonko said that heating and cooling rooms can be very costly. “Even adjusting the temperature a few degrees can use significantly less energy,” he said. Chonko said that Denison is making good steps in using energy more efficiently and reducing energy use, but there is still a ways to go.